The North Front Range region comprises three separate fixed-route transit agencies, operated by the region’s three large communities, and one demand-response service. 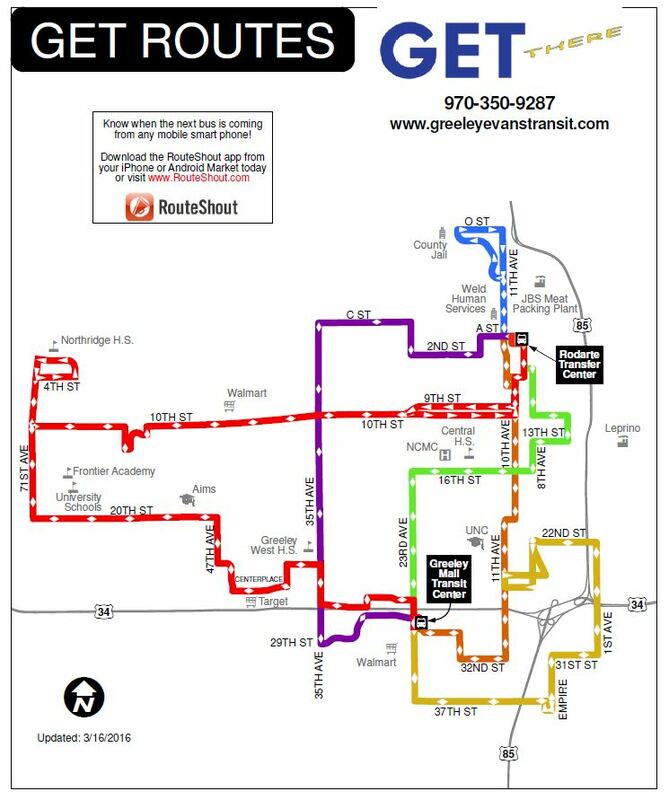 CDOT currently operates the Bustang service, connecting Fort Collins and Loveland to Denver. Transit is an important part of the growth anticipated to occur in Northern Colorado over the next 25 years. As a result, all transit agencies in the region are part of either the Larimer County Mobility Committee (LCMC) or the Weld County Mobility Committee (WCMC). COLT, GET, and Transfort, the three large transit agencies, are also active members of the Technical Advisory Committee (TAC) as alternates for the three large cities. The NFRMPO Planning Council adopted the 2045 Regional Transit Element on November 1, 2018. For more information, read about the 2045 Regional Transit Element. US85 (Eaton to Greeley and Denver). In addition, the 2045 RTE recommended combining the Coordinated Plan with the RTE, ensuring equitable investment, maintaining the Transit Development Program (TDP), and expanding education. These recommendations are based on the transit portion of the NFRMPO’s 2040 Regional Travel Demand Model, and the North Front Range Transit Vision Feasibility Study. Read more about the 2045 RTE. The City of Loveland Transit (COLT) system is operated by the City of Loveland’s Public Works Department. 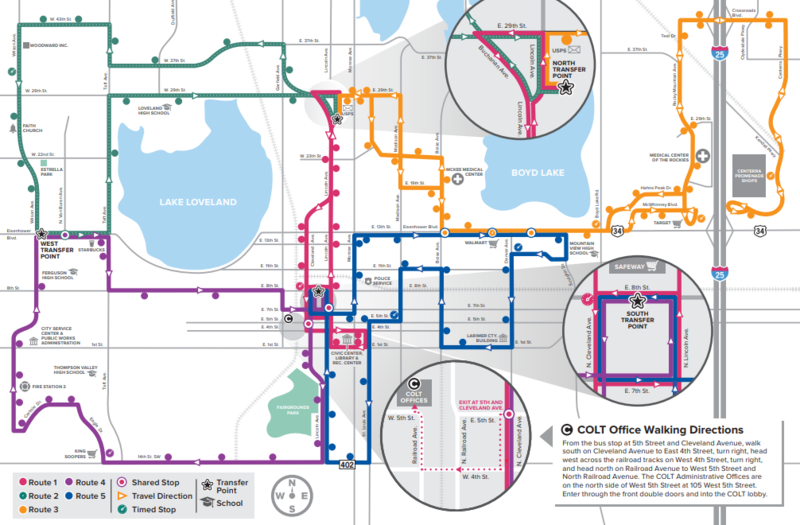 COLT’s fixed-route service runs from 6:38 a.m. to 6:48 p.m., Monday through Friday and from 8:38 a.m. to 5:38 p.m. on Saturday, with half-hour to one-hour headways. Paratransit is available during the same hours for eligible passengers. Five routes provide service from two main transfer centers: Loveland Food Bank and the South Transfer Center on 8th Street. The City of Loveland also provides funding for the FLEX service between Fort Collins, Longmont, and Boulder. 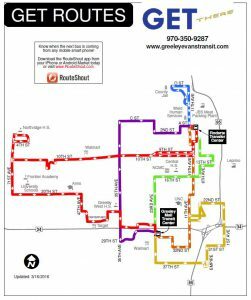 Greeley-Evans Transit (GET) is operated by the City of Greeley and provides fixed-route, paratransit services, and Call-N-Ride, to the public within Greeley, Garden City, and Evans. Service to Evans and Garden City is provided through an Inter-governmental Agreement (IGA). All University of Northern Colorado students are able to ride free with their ID. The Ride Free with ID program was extended to all students in Greeley and Evans. Students can show their student IDs to bus drivers, obtain a free school year pass, or show their state-issued ID to the drivers. The service has allowed students to participate in a variety of after school activities they were not able to previously. 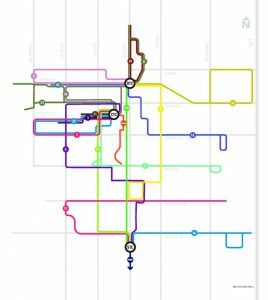 In 2016, GET updated its route system, which shifted the previous one-way loops with bi-directional linear routes. Transfort is the largest transit agency in the region, serving the City of Fort Collins. The service has seen record growth in the past five years, specifically after the opening of the MAX bus rapid transit line and partnering with Colorado State University to provide students with free service. To the left is the current route map, which shows the current 22 routes. In 2014, Transfort opened the MAX bus rapid transit route along the Mason Corridor. The route operates in its own right-of-way between Harmony Road and Prospect Road, then a shared corridor through CSU’s campus and on Mason Street in Old Town Fort Collins. The route runs every 10-minutes throughout the day and provides important connections at the Downtown Transit Center and the South Transit Center. Transfort operates the FLEX services in partnership with Loveland, Berthoud, Longmont, and Boulder County. The local service provides service along US 287 between the South Transit Center in Fort Collins to the Longmont terminus at 8th and Coffman Park-n-Ride, with stops in Fort Collins, Loveland, Berthoud, and Longmont. The express service stops at all MAX stations in Fort Collins, stops in Loveland, then runs express to Longmont and the City of Boulder. The express service is possible due to additional partnerships with the University of Colorado-Boulder and CSU. The Berthoud Area Transportation Service (BATS) has been operated by the Town of Berthoud since 2006. BATS provides shared-ride demand-response service for residents in an approximately eight square mile service area. The service area includes the developed portion of Berthoud and the immediate area surrounding the Town. BATS transports riders to Longmont on Mondays, with trips to Loveland provided each Tuesday through Friday. Out-of-town rider pickups begin at 8:00 a.m., with a return trip to Berthoud at 11:30 a.m. In-town trips are provided from 8:00 a.m. to 4:00 p.m., Monday through Friday. There is no service on holidays and any rides must be scheduled at least 24-hours in advance. The Bustang service operates between the Downtown Transit Center, Harmony Road Park-n-Ride, US 34 Park-n-Rde, and Denver Union Station. Operating six round-trips per day, Bustang provides interregional service between Northern Colorado and the Denver Metro. At Denver Union Station, riders can connect to the RTD bus, light rail, and commuter rail system. At both stops in Fort Collins, riders can connect to the Transfort system, and in Loveland, to the COLT system.